Indonesia, a vast maritime country with 70% ocean area is full of sea potentials. Ocean richness such as various kinds of fish and coral reefs, from the common until the rarest one, all live in Indonesian vast ocean. Besides having potential as underwater habitat, Indonesian sea also showing a great potential as a recreation place which has attracted so many tourists. As one of the island in Indonesia, Bali especially South Bali area is a paradise of sea. Bali has various waves from the smallest until the biggest so it becomes favorite for the surfers. Most of beaches in Bali have been known as “must-visit” tourism objects during tourists’ stay in this island. One of famous beaches which are very identical with Bali is Kuta Beach. This beach is indeed one of the bests which are never lack of visitors. In this beach we can see a flock of people sunbathing and surfing on the challenging waves. However, Bali is not only Kuta because there are still a lot of other beautiful famous beaches such as Dreamland Beach, Sanur Beach, Pandawa Beach, and many more. Besides getting its fame by the natural beauty, beaches in Bali are also very clean keeping the visitors comfortable. 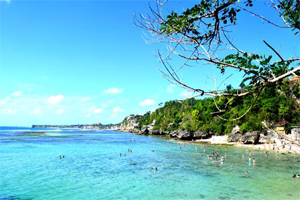 Well, for you who have visited Bali, have you heard about Padang-Padang Beach? Maybe only small numbers of people know its existence or ever visit this hidden beauty. This beach’s name is indeed not as famous as other beaches in South Bali. This white sand beach is located in Labuhan Sait Street, Pecatu Village, South Kuta District of Badung Regency. In a glance, there is no big different between this beach and other similar beaches. However, the remarkable thing from this beach is its location. To enjoy its beauty, we must cross and climb high cliffs surrounding the beach. These cliffs are formed from the pounding waves of Padang-Padang Beach, creating small and big caves. The tiny gap formed by this natural phenomenon is the only way for crossing. In fact, it can only be crossed by one person, so when you meet someone along this way one of you must step aside. However, this is such a kind of uniqueness that this beach possessed compared to the other beaches. 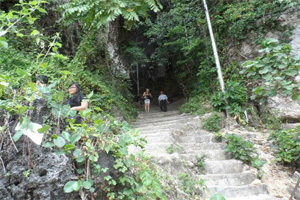 Walking down the stairs and crossing the gap between the rocks or caves are like an adventure that you must face before arriving into the paradise island. Although it is a bit hard to be reached, when you finally arrived in Padang-Padang Beach all your effort will be paid off. Actually, this beach had gained its famous since 1996 when a band “Michael Learns To Rock” used this beach as shooting location for their song video clip “Someday”. This beach’s name were then even boosted by the Hollywood film “Eat, Pray, & Love” starred by Julia Roberts took some of the scenes in Padang-Padang Beach. Padang-Padang Beach is located around 32 km from Denpasar City and if you land on Bali through Ngurah Rai International Airport, it will only need 45 minutes. This beach has clear turquoise water and far distance from all the noises of a city, so it is a perfect place for relaxing, sunbathing, and surfing. Padang-Padang Beach is also well known for having great coral reef, so besides those activities mentioned earlier you can also do snorkeling to see directly its underwater beauty. Because of its beauty and uniqueness, this beach is in the category of top 20 beaches of South East Asia. Padang-Padang Beach is also one of the best surfing areas in Bali because of its rocky seabed which can create barrel waves; a great wave for surfing. Almost every year, international surfing events are held in here. One of the examples is Rip Curl Cup Invitational which is held in Padang-Padang Beach every July and August. As one of the best beaches in Asia, Padang-Padang Beach is also supported by complete facilities such as wide parking area for its visitors. There are also a lot of café and shops selling food and beverages and some souvenirs. So, if you want to taste the adventure and unique beauty in this beach, do not hesitate to visit Padang-Padang Beach. Its charm, cleanliness, and tranquility can make you feel at a hidden paradise. Menjangan Island is one of the uninhabited small islands which are still the part of Bali Island. 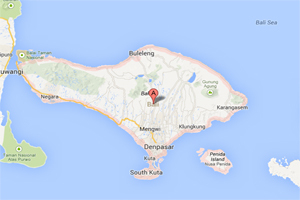 This island is located about 10 km to the west of Bali Sea. 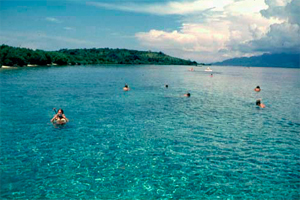 Menjangan Island is the part of West Bali National Park. From Denpasar, this island can be reached around 4 hours by vehicles, and situated around 60 km from the famous Lovina Beach. “Menjangan” is actually a Balinese word means “deer”. Indeed, this white sand island is named like that because a group of deer lives freely in this island. Although it is just a small uninhabited island, Menjangan Island is never empty from visitors. Besides the tourists, Hindu people also almost every day come to this for praying because the existence of a complex of holy temple on this island. 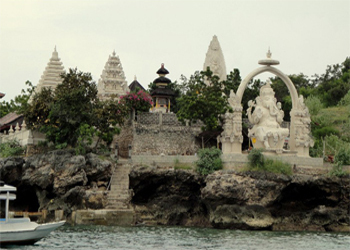 In Menjangan island, there are 8 temples which become the visitors destination. One of them is Segara Giri Dharma Kencana Temple. This temple is one of the historical temples in Bali which is highly related to the holy journey of a Hindu priest called Dang Hyang Siddhimantra to Bali. It was said that long time ago, Dang Hayang Siddhimantra was the one who separated Java and Bali which were on a same big island by slasing his magic wand. This temple was built as the token of appreciation from his followers. The word “Giri” means earth or area; “Dharma” means virtue; and Kencana means line. So, Segara Giri Dharma Kencana Temple means a temple in the line and area of virtue. Looking to the other side of the island, you can see the beautiful blue ocean surrounding the island. Actually, this pretty white sand island also possesses amazing underwater scene. Coral reefs and sea biota live well because of the healthy environment making this area as one of the best snorkeling spot in Bali. The first snorkeling and diving activity was done professionally in 1978 when the Indonesian Marine Force became a sponsor of a diving gathering from several diving clubs in Indonesia. That gathering was the stepping stone of the Menjangan Island as an international diving and snorkeling spot in Bali. As one of the best diving spots, the area of Menjangan Island is divided into some points with 60 meter drof off and complex stone and reef formation. These stones and reefs create some big and small caves which become the habitat of the corals, various kinds of fish. In the depth of 45 meters from the surface, there is a diving spot called the Anchor Wreck. As its name implies, there is a wreck of a ship with its rusty anchor. Besides that, the location is also called Anker or Slave Ship. This ship was suspected as a wreck of a Dutch ship in the 19th century which was the carrier of Balinese who would be sent to Batavia (now Jakarta) as slaves. Inside the ship, there are so many chests found containing china and glass bottles. If you dive around this wreck, it is highly possible that you can see some turtles and sharks. There are some diving spots which can be found in this island. The area called Eel Gardens located in the 40 meters diving spot is the best spot on the west of Menjangan Island. As its name implies, in this area there is big groups of garden eel and sea fans colony. Next, the Secret Bay is a paradise for the macro-photographer, video-operator, and sea biologist. In this spot, there are so many rare species including various kinds of sea horse. If you want to visit Menjangan Island and enjoy the beauty of its sea, the main transportation is boat which can be found in Teluk Terima Village. Another access for reaching the island is a small pier in Banyuwedang gulf. Crossing to Menjangan Island needs approximately 30-40 minutes. With Rp 40,000 – Rp 50,000 per person, we can rent snorkeling equipments. If you want to try the Sharing Boat plus snorkeling package, you can also get it for Rp 250,000 per person or Private Boat for Rp 1,200,000 for maximum 5 people. Usually, those prices have included boat rent, snorkeling equipments, guide, entrance ticket, and life insurance. Because this island is very small and uninhabited, there will be no restaurants or minimart found there. If you want to visit Menjangan Island, make sure to bring enough supplies, medicines, and other necessary things so you can fully enjoy the charm of Menjangan Island. The historical and the oldest beauty pageant in the world, Miss World had been officially started on Sunday, 8 September 2013 in Mangupura Ballroom, Westin Nusa Dua Hotel, Bali. In that grand opening show, all the 130 contestants from all over the world performed charmingly with beautiful gowns which were designed by talented Indonesian designers. In the opening ceremony, some of the finalists also showed their skill in dancing Fan Dance. In the end of the show, all of the contestants performed once again in various Indonesian traditional costumes. Grand opening ceremony of Miss Worid 2013 was opened by kecak dance which was performed by Balinese artist, I Ketut Rina with 150 dancers consists of adults and some children. Kecak dance is one of the famous Balinese dances. This dance shows a fragment of Ramayana story when the monkey troops helped Rama to face the evil Rahwana. Besides kecak dance, other performances were also done by some Indonesian musicians and singers who sang some national and traditional songs of Indonesia. This grand opening ceremony was also attended by the Miss World 2012 Yu Wenxia from China and Julia Morley, the leader of Miss World Association who is also the wife of Eric Morley the founding father of Miss World. Besides that, Liliana Tanusudibjo who is the founder of Miss Indonesia also presented at the show. Since their arrival in Bali Island, the contestants have followed the quarantine phase and some activities arranged by the committee of Miss World 2013. After the opening ceremony, the next day, the finalists must follow Miss World Beach Fashion 2013. Uniquely, the bikini contest which used to be a routine in this event is now changed into Balinese sarong contest. This (temporary) change is due to Indonesian which fully respects the eastern culture emphasizing on dressing courtesy. In this contest, the delegation of Indonesia, Vania Larisa was in TOP 11 and ranked fifth from all of the contestants. Miss World Sports Challenge was also done after the opening ceremony which was still located in Nusa Dua area. In this activity, the contestants did some sports. Again, the unique thing you could see here is the contestants did some Indonesian typical sports which are usually seen on the Indonesian Independence day celebration such as “bakiak race”, tug of war, water-pail race, and volleyball. Although these sports are traditional, the contestants were still enthusiastic. Unfortunately, Indonesia did not win this competition. 10th of September 2013, all of the Miss World finalists visited and prayed in the greatest Hindu temple in Bali, Besakih Temple. The temple which stands firm on the foot of Agung Mountain is located in Karangasem Regency, Bali. Wearing Balinese sarong and unrevealing dresses, most of the finalists was amazed by the biggest temple in Bali and said that it was such a new experience for them. Led by the holy priest of the temple, the finalists prayed solemnly in the tranquility of this temple. After praying, these girls were taken to take a look around the temple and know more about the famous, beautiful, and holy Besakih Temple. It was such a valuable experience since they got so many insights of history and culture of Bali. After finishing their tour in the Besakih Temple, the contestants also got a chance to learn Balinese dance with some children around the area of this emple. The trip to Besakih was ended by taking photograph which the background was this temple’s beauty. The trip was then continued to visit Rudana Art Museum which is located in Ubud, Gianyar Regency. This museum was established by a painting collector named Nyoman Rudana and was officially inaugurated by President Soeharto at Desember 26th 1995. This museum has more than 400 paintings and statues from various Balinese artists and also foreign artists who found Bali as their home. Besides visiting a lot of places in Bali, the finalists of Miss World 2013 is also planned to visit Yogyakarta before they land on Jakarta and follow more activities. Finally they will give their best in the Grand Final of Miss World 2013 which is planned to be held in Sentul International Convention Center, West Java, on Saturday 28th of September 2013. This September, Bali is visited by pretty women from all around the globe. They are not ordinary women, because they are the “princess” from their respective country. They will compete in a well known beauty pageant, Miss World which now is held in Indonesia. Miss world is the biggest and the oldest beauty pageant in the world. This contest was started in United Kingdom in 1951 which was founded by Eric Morley. The organization center is located in United Kingdom and now is led by the wife of Eric Morley, Julia Morley, after the founding father died in 2000. Miss World also owns franchises in more than 100 countries. Since founded in 1951, Miss World Organization has collected some charity funds for children all over the world. Miss World was started from bikini contest which at that time was started to be introduced to public. Miss World is under a big organization which every year holds the pageant followed by hundreds of beautiful ladies. One of the requirements for being the contestant of Miss World is being able to win the national beauty pageant in their respective country and become the “Miss”; or delegated by the license holder of Miss World in that country. The first Asian who won the Miss World was Reita Faria from India, when Miss World Pageant 1966 was held in Great Britain. This year, this contest is held in Indonesia. After waiting for about 62 years, finally this country is trusted to be the host of this big event as well as the first South Asian country to hold such an event. Bali Island is chosen as contestants’ temporary resident and quarantine center for one month. Here, these Misses must follow a thigh schedule of activities, including learning about Bali and Indonesia. Besides Bali, Jakarta is the other place for this event. It is planned that Jakarta will the place for the Miss World 2013 final venue, which will be held in Sentul International Convetion Center, West Java, on Saturday September 28th 2013. Miss World 2013 is followed by 131 contestants which are the delegations of various countries. This year, Indonesia is represented by the winner of Miss Indonesia 2013, Vania Larissa which will compete against the other 130 contestants. Since now, Indonesia has followed this beauty pageant for 11 times. During their quarantine period in Bali, the contestants will also be introduced with the diversity of culture in Bali and Indonesia. After they arrived in Bali, these girls were taken directly to Tanah Lot; a famous beach tourism object which is well known for its amazing sunset in Tabanan. Besides Tanah Lot, during the quarantine and judging phase the contestants will also visit the other tourism objects in Bali such as Garuda Wisnu Kencana (GWK) where giant statues of God Wisnu and Garuda Bird stand tall between the firm limestone rocks; Rudana Museum in Ubud; Bali Safari and Marine Park; and Besakih Temple which is located in the foot of the Agung Mountain in Karangasem and is the biggest temple in Bali. In Bali, Miss World’s activities will be centered in Nusa Dua, a well known tourism area. With slogan “Beauty with a Purpose” the contestants of Miss World will be judged not only from their physical beauty, but also intelligence and personality. The winner of Miss World will live one year in London during the period of her duty. The Miss World will travel all around the world to follow charity activities and other similar events as the representative of Miss World Organization. The current Miss World is Yu Wenxia from China which was the winner of Miss World 2012. The selection of Indonesia as the host of Miss World 2013 is a great opportunity for this country to be able to introduce and promote the diversity of culture in Indonesia and especially Bali. Bali as one of the world’s tourist destination is one of the most attractive islands. 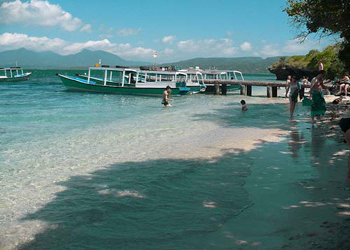 Moreover, this island is very famous for its hospitality and interesting nature and places. Bali has a lot of amazing tourism areas, beautiful beaches, and various kinds of culture and tradition which is different even for the other regions of Indonesia. 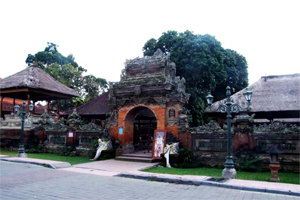 Bali also has a lot of historical places which add more value to its tourism sector. With the holding of this Miss World Pageant 2013 in Bali, it is expected that all people in this planet can witness the beauty and uniqueness of nature and culture in Bali, and Indonesia. For you who often spend your holiday in Bali especially through the sky, you must have already been familiar with Ngurah Rai International Airport. This one and only airport in Bali is the main gate to the island for most of the foreign tourists. The airport which is located in the area of Tuba, Badung is now undergoing renovation which in the near time will be officially opened and fully operated. Before discussing about the current Ngurah Rai Airport, it will be more interesting if we take a glance over this airport’s past. Ngurah Rai Airport was firstly built in 1930 by Voor Verkeer en Waterstaats (a kind of Public Works Department owned by Dutch colonialist). Actually, it was far from an “airport” but only a 700 meters grass airstrip spread on the farm land and graveyard of Tuban village. During that time, this airstrip was not named Ngurah Rai Airport yet, but Tuban Airport or Pelabuhan Udara Tuban. After passing several wars and independence struggles (including bombed by the Japanese, finally in 1949 terminal building and air traffic controller (ATC) tower was built from woods. Then, during 1963-1969 this modest airstrip was renovated by the government of Indonesia with purpose of improving Bali’s tourism. 1st of August 1969 was the moment when this airport was officially opened after the renovation process and at the same time this airport’s name was changed into Ngurah Rai International Airport. The name “Ngurah Rai” was chosen to commemorate the services of national war hero from Bali, I Gusti Ngurah Rai, who serve all he got for the independence of Indonesia. After that, this airport keeps getting improvements and developments until now. As time goes by, Ngurah Rai Airport undergone so many renovations starting from the runway expansion, equipments advancement, until facilities improvement to suit its predicate as an international airport. These recent years, if you often visit Bali or leave Bali, you must have whining at least once for its crowded and uncomfortable situation. This condition is just temporary because it is still in a renovation. However, all people seem understand about this process which later on will be beneficial for them too. The good news is the renovation process is almost done. 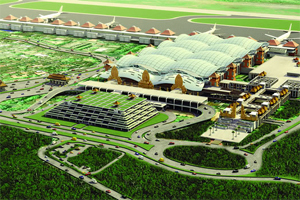 It is planned that on the 11th of September 2013, Ngurah Rai Airport will be operated fully with its new terminals. Meanwhile on the next day, 12th of September 2013, the new terminals will be officially opened by the presideng of Indonesia, Susilo Bambang Yudhoyono. According to the administrators, the new Ngurah Rai Airport will adopt sophisticated modern technology combined with typical Balinese local culture. 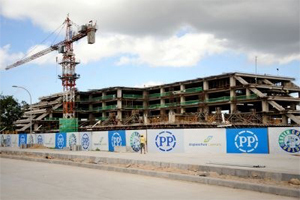 Ngurah Rai Airport will operate with three storey for facilitating the arrival and departure of visitors. The building is designed to have modern architecture with Balinese accents around it. Based on the opinion of Indonesian State-owned Enterprises Minister, Dahlan Iskan, the new Ngurah Rai Airport has “five star” class. It is worth to be waited how the new look of Ngurah Rai airport will be. 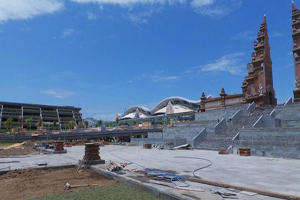 It is not a secret that the renovations done to this airport is a part of Bali’s preparations in welcoming the APEC CEO Summit in the upcoming October. Besides renovating the look of the airport, the administrators have also added the capacity of private jet apron which is still under intense construction. This extra apron is located in the southern part of the airport. This construction is expected to be able to add around 14 airplanes parking spot which can accommodate about five Boeing 737 and more private jets. This effort is done to give more comfort for the nations’ delegations in visiting Bali. During the APEC Summit 2013, Ngurah Rai Airport will be closed for three days; first at Sunday (6/10) from 10.00-20.00 local time, Tuesday (8/10) at 13.00-20.00 local time, and Wednesday at 07.00-14.00 local time. Outside those hours and after the summit, public flight will be run normally. For your information, 21 nation leaders or government heads, 5000 journalists, around 2500 delegation members, thousands of committee, observers, professionals, technical team, and securities will attend the APEC CEO Summit 2013 in Nusa Dua, Bali. Bali is a beautiful and wonderful small island of Indonesia. Because of its location in tropical area and is surrounded by vast ocean, Bali has a lot of sea products. Therefore, if you go on holiday to Bali, you should take your time to try various seafood dishes which can be found in some areas in Bali. 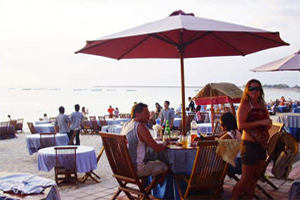 The most famous area for having seafood in Bali is the two adjacent beaches in South Bali named Jimbaran and Kedonganan. Jimbaran Beach is one of the pretty beaches with stunning sunset panorama. This beach is located in Jimbaran Village, Badung Regency. 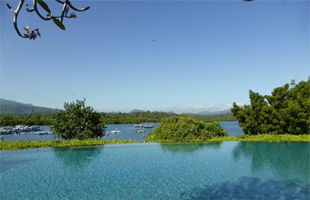 Its location is quite easy to be accessed, around 40 minutes from Denpasar city and 15 minutes from Ngurah Rai Airport. Besides beautiful landscape, white sand, and amazing sunset, Jimbaran Beach is also a home of seafood restaurants with quality dishes, great service, and of course special experience. You can have your dinner whilst watching the sun sets in the horizon of the vast ocean line in front of you. Seafood dishes available here are varied. For the price itself, there are also a lot of choices from the special prices until the affordable one which depends on you to select. Hence, this area is not only flocked by foreign tourists, but also local tourists. If you are spending holiday with your couple, this beach is the perfect place for you. You can enjoy a lovely dinner with romantic beach atmosphere and beautiful sunset as the background. Because of its strategic location, you should not worry about accommodation. Along to road heading to this beach or around the area of this beach you can easily find starred hotels, villas, or inns. Other than dinner and sunset, Jimbaran Beach also offers some water recreation such as parasailing, surfing, and boating. The entrance ticket to this beach is just 5000 IDR per vehicle; a cheap value for the best experience that you can have. Kedonganan Beach is the “neighbor” of Jimbaran Beach. 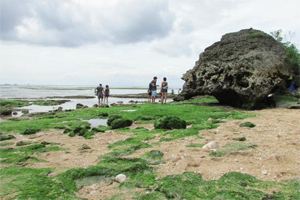 This beach is situated in Tuban Village, District of Kuta, Badung Regency. Because of its adjacent location with Jimbaran Beach, the trip to this beach is relatively the same, around 40 minutes from Denpasar abd dan 10 minutes from Ngurah Rai Airport. Similar to Jimbaran, Kedonganan Beach also possesses beautiful panorama with white sand and calm wave. This beach is very suitable for sunbathing or even just hanging out enjoying sea panorama. In the afternoon, this beach displays great sunset scenery. Something that differ this beach from the other beaches around its area is the existence of some traditional boats which is sailing in the middle of the sea catching fish. This kind of display cannot always be seen in the other beaches such as Kuta or Legian. Kedonganan Beach is one of the famous fish markets in Bali. Here, you can buy various kinds of fishermen’s hauls with relatively cheap prices. These hauls are taken directly from the sea with the traditional boats and sold right away in fresh condition. Visitors can pick the desired fish and bargain with the seller directly. With the existence of this fish market, no wonder that many seafood restaurants are built around this area with menus offering grilled fish, lobster, shrimp, squid, and many more. These restaurants are very crowded usually in the evening until night. 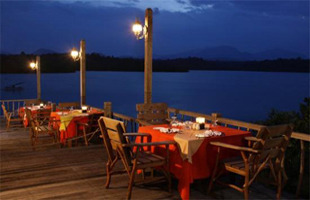 Evening is the perfect moment for having seafood with sunset panorama meanwhile night is the best moment for having a romantic dinner with your couple. At the time when the restaurants’ and café’s lights are lit, you can see thousand beautiful flickers around the sea. 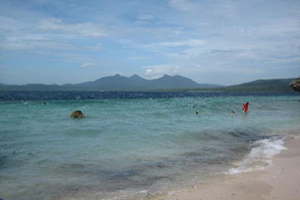 Different from the other beaches, the management of Kedonganan Beach is given fully to the local villagers. Therefore, most of the restaurants are owned by the local residents. However, not all villagers run restaurants for living, there are also other people who work as fishermen. As it was mentioned previously, you can see a lot of traditional boats in Kedonganan Beaches which are owned by the local fishermen. Uniquely, those boats or called jukung can be rent for taking us sailing around the sea in that area. Both of the beaches are “must visit” places when you are in Bali. Most of the travel agencies and tour packages usually also include these beaches into their packages. If you had holiday in Bali and had not had dinner here yet, then your holiday was not complete. Make sure to put either location into your next holiday schedule. 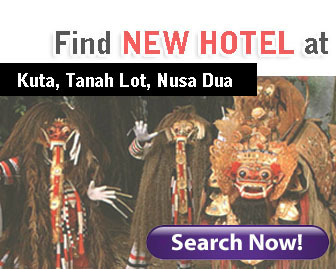 Bali has already known as one of the favorite tourist destinations globally. In the previous articles, there have been a lot of tourism objects discussed, especially natural objects like mountains, lakes, or beaches. Amongst the beaches, there is one famous name which is not yet discussed; Kuta Beach. No one doubts this beach’s worldwide reputation as the best beach for holiday. Almost all tourists who come to visit Bali must have visited this beach. Having holiday in Bali without visiting this white sand beach is indeed incomplete. 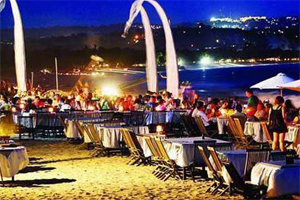 Kuta Beach has been becoming a famous icon of Bali Island. Before discussing the tractions of this beach, let us glance at its history first. At the beginning, before Kuta Beach was famous as tourism object, this beach is a trading port. Here, the yields of Balinese were sold to the merchants from various origins. 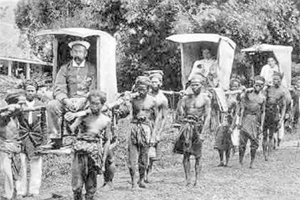 In the 19th century, a Danish merchant named Mads Lange came to Bali and built his trading headquarter in Kuta. It was the beginning of the development of this area. After that, Hugh Mahbett also wrote a book entitled “Praise to Kuta” which disenchanted the local residents about their land’s potential and encourage them to anticipate the upcoming tourist “invasion” to Bali. As the time goes by, many tourism facilities were built such as hotel, restaurant, and so on. The main attracting power of Kuta Beach is of course the stunning panorama which is enchanted by the sparkling clear white sand. This area is located on the west side of Bali Island, so it is a perfect area for observing the sunset. In the morning, Kuta Beach is visited by tourists searching for fresh air or doing jogging. In the daytime, the tourists usually gather around the beach to enjoy the panorama while sun bathing under the warm tropic sun. The surfers spend their time by trying to ride on the challenging waves of Kuta Beach. If you are interested in trying this sport, you should have no worries because there are a lot of surfboard rentals and surfing course which can help you learning the techniques of surfing in no time. By spending around 50 thousand – 150 thousand IDR per hour, you can have both services. Under the guidance of the instructor, you will only need around 30 minutes for being able to squirm on your surfboard, or at the very least stand up steadily on your surfboard. In the afternoon, just like mentioned earlier, the tourists will flock into the beach to wait for the sunset to come. The tourists can enjoy sunset not only from the beach or shore, they also can do it while having meal in the restaurants or observing from their hotel room. This crowd does not stop until there because at night the atmosphere will be merrier since the tourists will flock into interesting places around the beach such as café, restaurants, clubs, and so on. We can always see that this town never falls asleep. Although the beach’s waves and current is relatively not dangerous, the safety of the tourists must always be kept. Hence, Kuta Beach is guarded by at least 40 coast guards. These men in red and yellow have a duty to watch over the risky areas around the beach. With complete equipments, three jet skis, and six boats, they are always ready to help and rescue if something wrong happens. 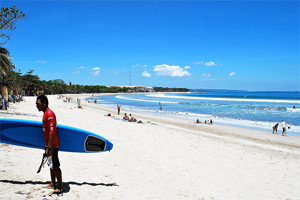 As the center of Bali’s tourism, Kuta indeed has complete facilities. You can easily find various hotels, inns, department stores, pubs, spas, and many more. For shopping activities, it is not only limited to the modern and updated items. You can always find Balinese typical souvenirs which are sold in almost every corner of this region. Same with the food. You can find international culinary until the tasty and unique local taste. In the long holiday season, the occupancy rate of the hotels in this area can reach 90 until 100 percent. The times are Juli-Agustus (full of domestic, Australia, Eropa tourists); end of November – middle of January (Indonesia & Australia); March – April (Russia & Japan). If you want to stay around Kuta area within those holiday season, you may need to book a room from a long time! 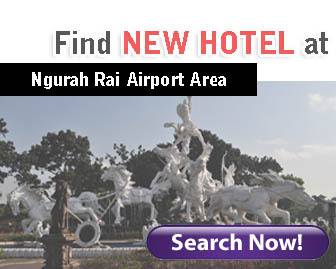 From Ngurah Rai International Airport, Kuta Beach can be accessed in approximately 10 – 15 minutes. There is no entrance ticket for visiting this beach. However, no big public transportation vehicles are allowed to pass the nearby areas. So, if you want to go here, you can use taxi, car pool, personal vehicles, or if your hotel is quite near, you can go there on foot. If you want to go around without taxi, you can also rent personal vehicles such as bike/scooter, car, until bicycle. Bali can be said as the most unique, beautiful, and wonderful island in Indonesia; even the world has acknowledge that. However, now we are not going to discuss about Bali’s uniqueness in the sector of culture, landscape, or tourism. In this article, we are going to discuss about the new highway which has been on the spotlight recently. 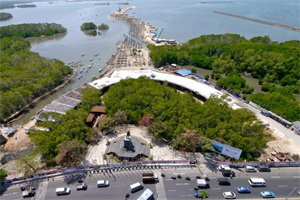 The new highway of Bali is the latest transportation infrastructure project of the government which can connect three bustling areas of Benoa, Ngurah Rai Airport, and Nusa Dua. This highway was already inaugurated (not opened yet) in Juli 2013. This highway is the first highway built in Bali. Besides that, this unique highway also passes over the sea of South Bali area which is very famous for its beautiful panorama. This “unnamed” highway has 12.7 km length which 10 km of it is located over the sea. This bridge-highway becomes the first and the longest in Indonesia which almost as long as Penang Bridge in Malaysia with 13,5 km length and Union Bridge in Kanada with 12,9 km length. Besides that, this highway will also become the second highway in Indonesia which provides special way for motorbike. It was expected that the existence of this highway can reduce the high traffic that often occurs at certain hours or holidays. 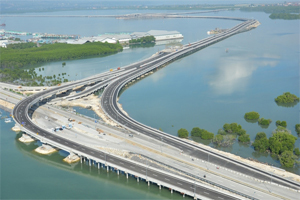 Now, after inaugurated and tested for the first time, this highway which temporarily called JDP (Jalan Di Atas Perairan) or Road Over the Sea; or also called Bali Highway is undergoing finishing phase. The contractor is working on completing the facilities of this highway such as setting traffic signs, toll gate, light, and so on. Some people have proposed few names for the first highway in Bali. For example, an academician from Udayana University, Prof I Nyoman Darma Putra suggested that this highway is named after a great Balinese artist I Wayan Lotring (1898-1983). There were also other named proposed for this highway such as Soekarno-Hatta (first president and vice president), I Gusti Ngurah Rai, I Gusti Patih Jelantik, or I Gusti Nyoman Lempad (Balinese great painter in the 20th century), until the name of current governor, Made Mangku Pastika. However, it seems that the certain proposed names have been set and reduced until there are only two options: Soekarno-Hatta or Bali Mandara. The grand opening of this highway is planned to be hold on 14th of August 2013 which coincides with the Bali Province Anniversary and Pagerwesi Day. One thing that we can proud of from this highway is all the design and construction was all done by Indonesians. Besides that, the construction process also involved around three thousand workers. We must admit that, often, the construction of mega structures in Indonesia needs help from foreigner, but this time we can manage to use our own resources. 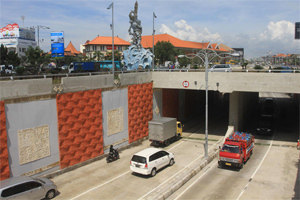 Underpass is another solution that Balinese government offers to reduce the traffic jam in Bali. Underpass Dewa Ruci consists of two ways; one from south (from Ngurah Rai Airport to Sunset Road) and one from north (from Sunset Road to Ngurah Rai Airport). This area is indeed the most crowded area that always experiences high traffic. The value of this underpass is estimated around IDR 136.19 billions. In the construction process of this underpass, the big statue of Dewa Ruci did not touched at all as a part of honoring the local value and culture. This underpass has already operated since May 2013. The construction of this highway and underpass is highly expected to be able to open more access and overcome the traffic jam problem which now is identical to the south region of Bali. Besides that, both of these infrastructures are also built as a preparation for the upcoming APEC Confrence in October 2013. However, the most important and significant benefit from it should not only for that worldwide event, but for Bali so that the tourism sector gets its space for breathing again.